Limited Edition Lithograph of THE FIRST PERFORMANCE ever by Jimmy Page, Robert Plant, John Paul Jones and John Bonham. 26 images from that magic evening. Click on the image above to see the entire art print. Big print with five photos of Jimi Hendrix from one of his last concerts ever (September 3, 1970). The overall size is 33x114 cm / 13 x45 inch. The price is only US$175 + shipping & handling. Click on the image above to see a bigger version and order your print. Welcome to a collection of my 50,000 photos of rock artists. At this point about 2000 photos are on display - more will be added. The shots are from the mid 60's till the mid 80's. Feel free to view the photos of your desire. Just please respect the copyright (see below). You can get your own original photographic prints from the original negatives and slides. Go to PHOTO SALE if you want to know more. From time to time special offers are available. Click to see the current SPECIAL OFFERS. What others have said about the photos. For use on web sites, in print or otherwise contact Jorgen Angel Photography. Should you want to bookmark or link to this site please link to this page only in order to avoid broken links when the structure of the site changes. ALL UNAUTHORISED REPRODUCTION, REDISTRIBUTION AND COPYING IS PROHIBITED. You may view Jorgen Angel's copyrighted photos. WITHOUT JORGEN ANGEL'S WRITTEN PERMISSION! 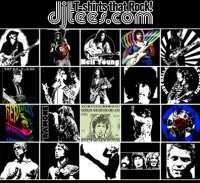 Check out DJTees' many excellent T-shirts. More than 150 of the designs are based on Jorgen Angel's images.